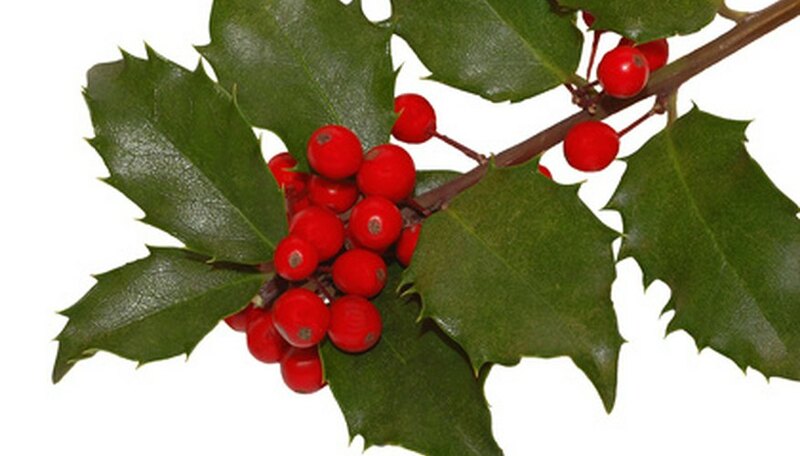 Holly bushes thrive in slightly acidic soils that contain high amounts of organic matter. The evergreen plants enjoy full sunshine, but will tolerate some shade. Yellowing leaves or lack of the telltale red berries may come from a number of reasons, one of which is poor fertilization. Applying fertilizer to the holly is best done in early spring or late fall after a hard freeze. Improper pH levels may be a cause for yellowing leaves as well. By performing basic maintenance to the holly bush, the evergreen perennial can bring enjoyment to the landscape year round. Test the soil from around the stands of holly bushes. Contact your local agricultural extension service for their process and procedures. Soil test results may take from three to six weeks to receive the analysis. Apply nitrogen rich, acid based fertilizer around the holly bush. If too much nitrogen fertilizer is added to the plant it may inhibit flower growth, and thus will reduce berry production. The extra nitrogen though may eliminate the yellow leaves. If no soil test was conducted, follow the label directions on the fertilizer package for broadleaf evergreen shrubs and plants. Various strengths and types of fertilizers will have different application rates. Consult the soil test results if the yellow leaves persist on the holly bush after the addition of fertilizer. The yellow leaf condition can be a result of an improper pH level. Add an acid based fertilizer each late fall, after a hard freeze, to the holly bush. Over time the acid base nutrients will aid in correcting any pH problem. Add a layer of humus rich compost down around the base of the bush. This will aid in the overall health of the holly plant. Keep a good layer of mulch under and around the holly bush for moisture retention, and to keep errant weed growth down to a minimum. Best berry production is seen by planting one male holly bush for every five to ten female plants. Consult your local agricultural extension service for any bulletins concerning the growing conditions of holly bushes in your area. Never apply fertilizer to any plant that is drought stressed. The chemicals may kill the plant.